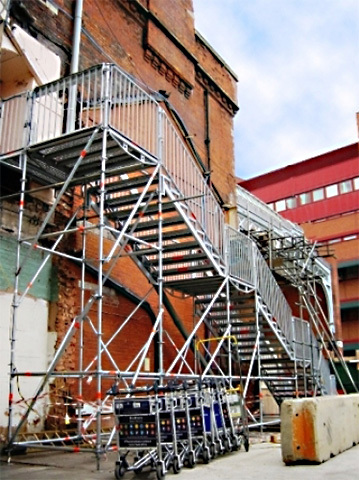 The Layher Public Access Staircase 750 is constructed using standard Layher Allround components (standards, ledgers, diagonals and decks etc.) with a few additional components (stairway stringers, deck locking clamps and handrails). Fully compliant and meeting all the requirements of public access and building regulations DOC sections K&B, this stair offers fast erection times on temporary staircases for use as fire escapes, walkways, access for public events, rail pedestrian crossings etc. Designed for high volume capacities in the movement of both site and public personnel.